Some people honestly make me amazed at the tenacity of us gamers, and this guy is one of them. AaroneousGaming set himself the task of getting to level 99 in Kingdom Hearts 3 without leaving the first world, Olympus. He accomplished the same feat for Kingdom Hearts and Kingdom Hearts 2, and unsurprisingly when he hit that sweet, sweet level threshold of 99, suffice to say things got a bit emotional. Just take a gander below to see that exquisite moment play out. Overall, it took AaroneousGaming a total of 284 hours and 11 minutes to reach the level cap in Kingdom Hearts 3, or 11 straight days without sleep, or 29 days if you played for 10 hours a day. Wowzers. If you add up how long it took him to reach the level cap in the starting world in all three Kingdom Hearts games, you’ll get a number that’s as terrifying as it is impressive: almost 1000 hours. One. Thousand. Hours. Aaroneous Gaming took to Twitter to commemorate the moment, expressing his surprise over how emotional he got upon reaching level 99. He also thanks his subscribers and donors, and it’s just so wholesome that you need to see it for yourself. There should be a club, or a temple, to all the streamers that accomplish such awe-inspiring feats. Not only are they a testament to how stubborn we can get with games, but by setting themselves such initially impossible goals and then smashing them reminds us all that all it takes to be extraordinary is the ability to never give up. 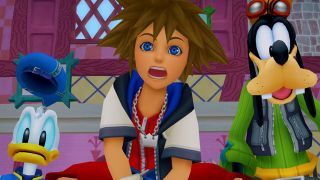 If you want more feel-good streamer success, here’s the story of a guy who beat all the Soulsborne games without taking a single hit, or look below to see what we thought of Kingdom Hearts 3!